“In this famous scene one can observe a typical 18th century school of fencing in full operation.” Mr. Angelo's fencing academy was located at the opera house at Haymarket in London. It remained at that site for many years until it was destroyed by fire on June 17th, 1789 and subsequently closed. The academy was reopened at No. 13 Bond Street, London where it remained for thirty years. 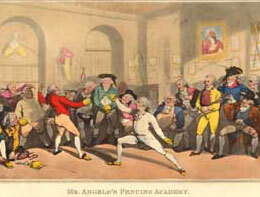 In this famous scene one can observe a typical 18th century school of fencing in full operation. In the center of a room crowded with spectators and fencers one can see Henry Angelo fencing with one of the students of the academy. To the far right Domenico Angelo - Henry’s father and head master of the academy - can be seen wearing a plastron and holding three foils in his arm while standing next to a seated gentleman. On the upper right there is a portrait of the famous swordsman the Chevalier De Saint-George. Along the walls there are racks holding foils, padded practice sleeves, crossed single sticks and a variety of picture frames containing various illustrations of fencing techniques.